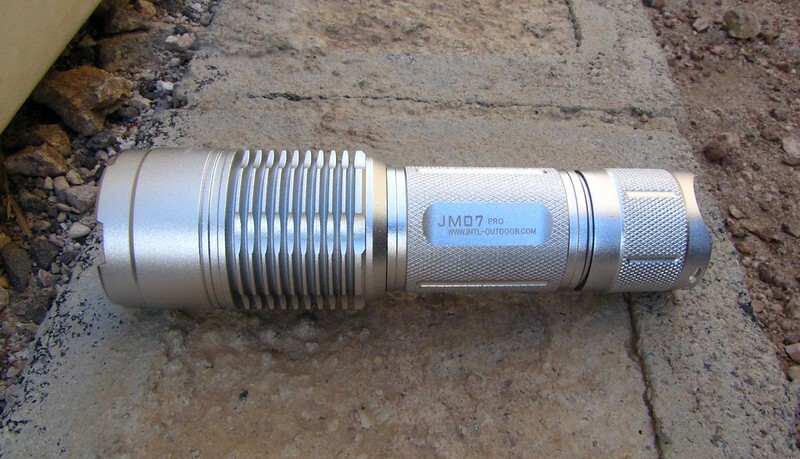 Bottom line: The JM07 Pro is a superb flashlight. 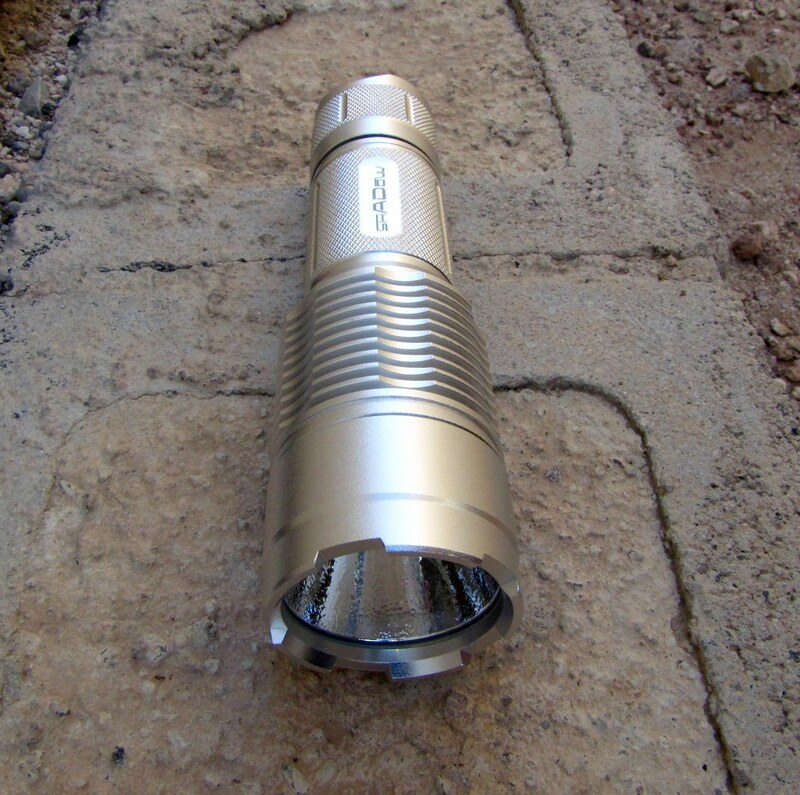 Anything an 18650 powered torch can do, a 26650 torch can do longer and the Shadow JM07 Pro is a potential watershed design. Its 10 deep-cut cooling fins could perhaps radiate a lot more heat than the well driven 2.45 amps the as-delivered driver pulls on high. 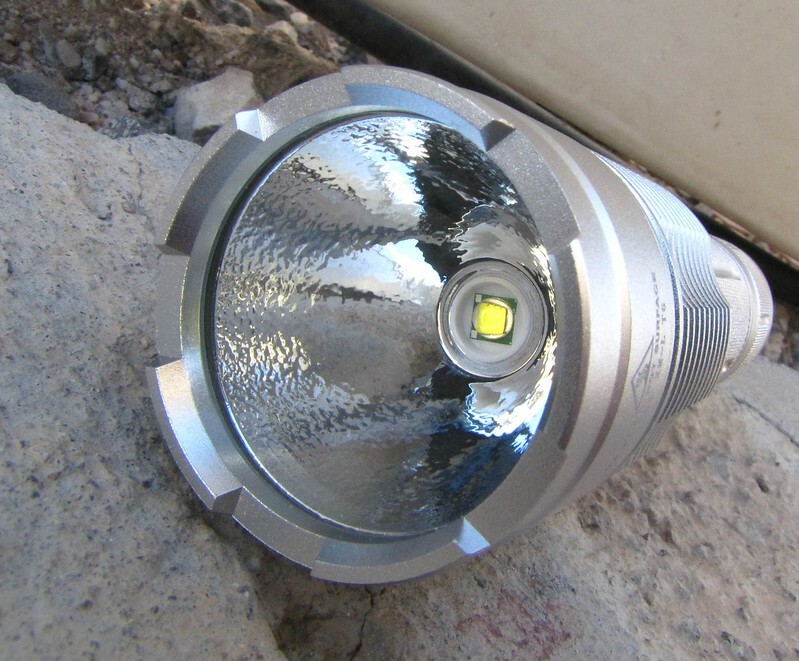 It is a thoughtful design, is very well constructed and has the lumens one expects from a proper XM-L light. If you like the JM07 Pro (and who wouldn't) get the black one and save yourself $10. If production for the Stone White edition is indeed limited to 50 pieces (site shows 15 left as of 3-4-12) and if the JM07 Pro becomes the 26650 torch to own, demand for the silver version will hurl logic out the window, inducing unwarranted smugness among the privileged few. 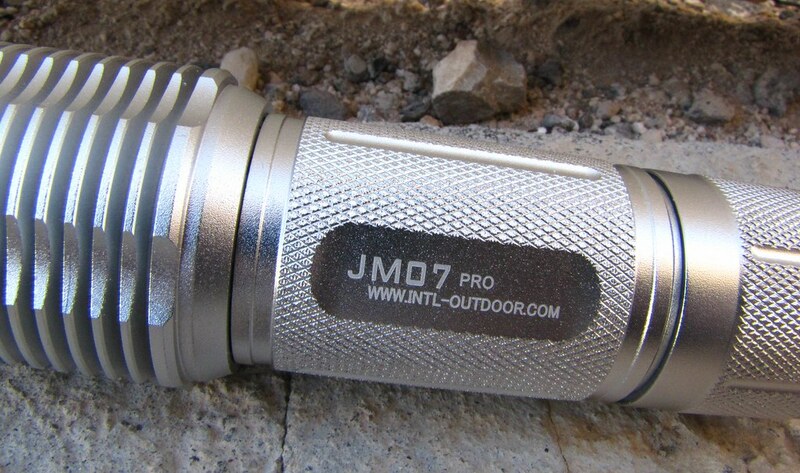 Of the five lights I got from Int'l Outdoor, this JM07 Pro is turning out to be the thoroughbred of the bunch. Its ascending three mode UI, comfortable fat body and versatile all-purpose OP reflector, not to mention it is more than bright enough, makes me wish I had a less pretty one to knock around. Not a single, functional hiccup and I like the new blue boot. 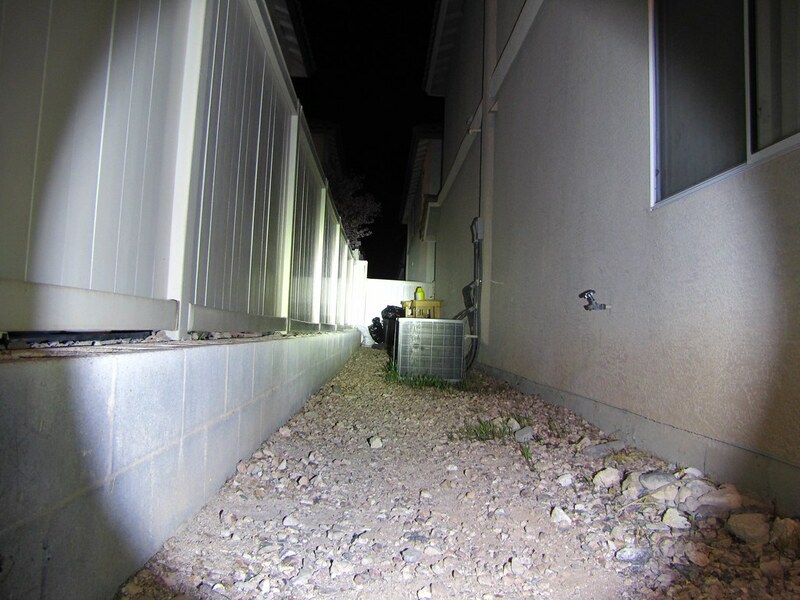 Run-time with a King Kong 26650 charged to 4.22 volts. Looks like you get about two full hours on high. 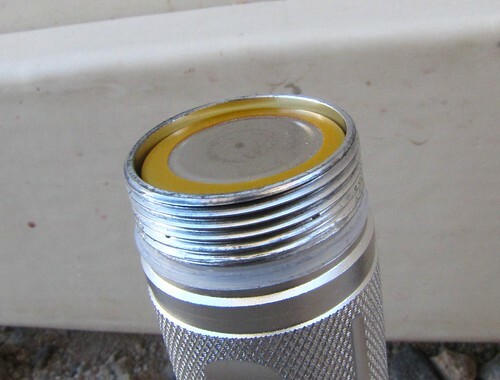 Flashlight arrived in flawless condition. I am totally in love with this form factor. 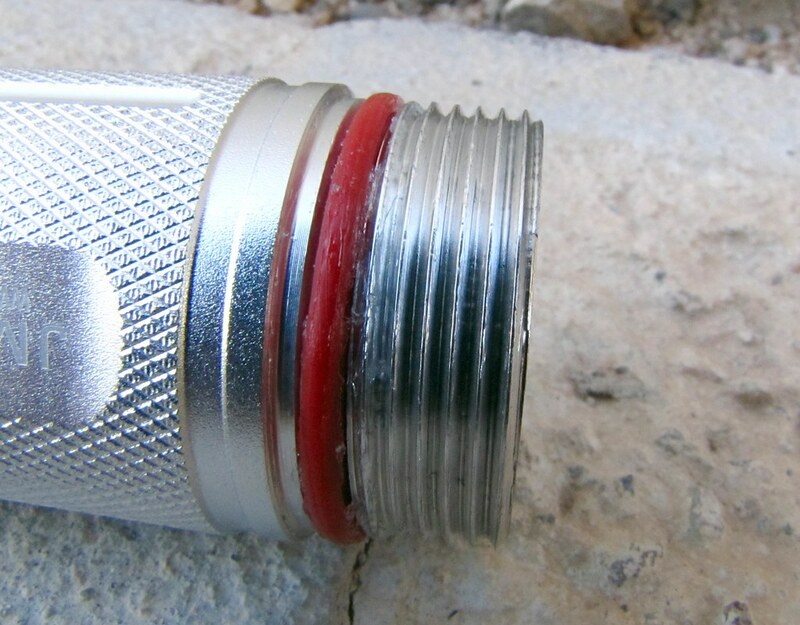 The JM07 is perfect for large hands and my only ergonomic complaint would be the knurling. I don't mind low, less aggressive cuts if the blocks are larger and/or far enough apart to do some good. Holding the JM07; the thumb naturally finds one of the six valleys cut vertically in the cooling fins (there are 10) while the forefinger wraps comfortably underneath. Held like this, the flashlight is just long enough to fit my large hand perfectly . . . .
. . . . nobody will mistake the JM07 Pro for a cheap flashlight. In use, it looks and feels expensive. To my eyes, the JM07 looked, at first, a little unbalanced. 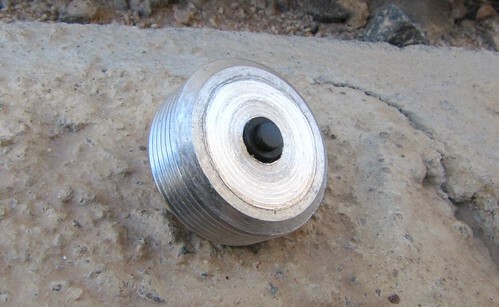 The larger diameter head/cooling fins are 67mm of its 147mm total length. It doesn't take long however, to discover that this torch is not head-heavy but it does feel appropriately substantial. I think the recessed tail cap switch with an extra "corral" around the boot looks awesome. Machine quality is great. If there were a disappointment, it would have to be the "matte" finish. I was hoping for something a bit smoother but the anodization on this JM07 Pro is top notch and lathe work is superb with no nicks or burrs. 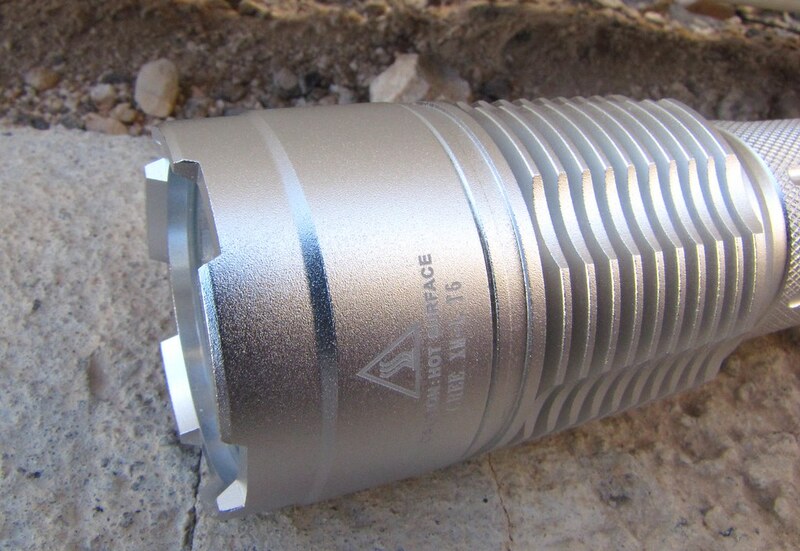 From any angle, The JM07 Pro is a handsome flashlight. I've carried it with me during the past 24 hours and it never fails to elicit a response from all who see it. It has been a rock solid performer too. Many of you will like the low-to-high mode arrangement but Foy prefers high-to-low. Not a deal killer but I also don't like the longish mode retention time. If you turn the JM07 Pro off too quickly after mode selection, it will come on in the next mode. 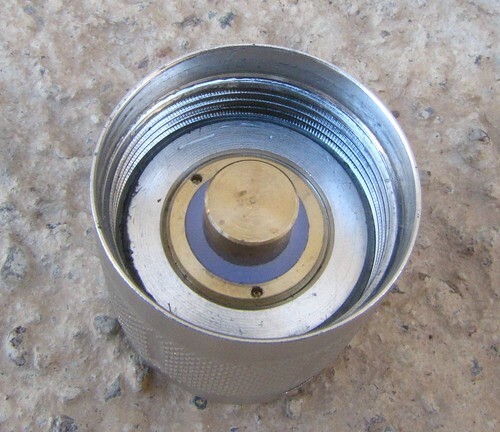 The emitter is perfectly centered and the OP reflector appears slightly more smooth, the deeper it gets. 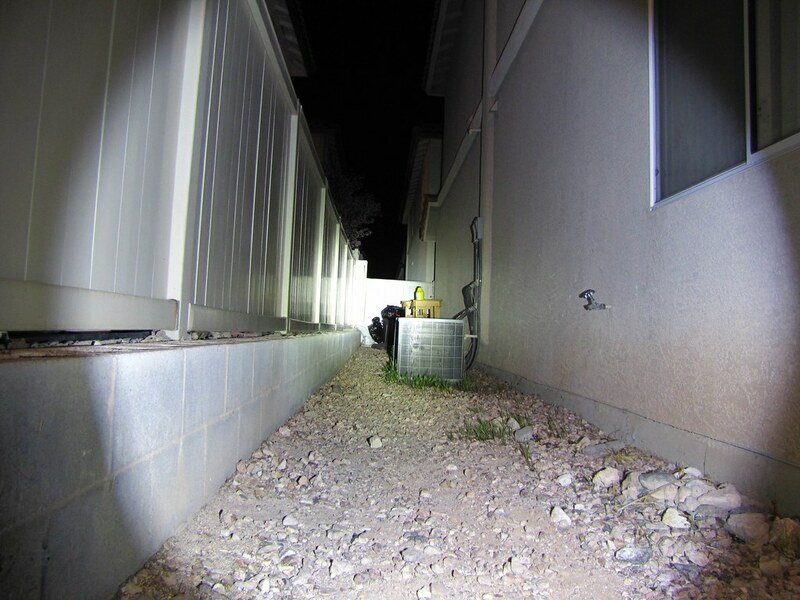 Wide openings cut into head make the JM07 great for night stand duty. 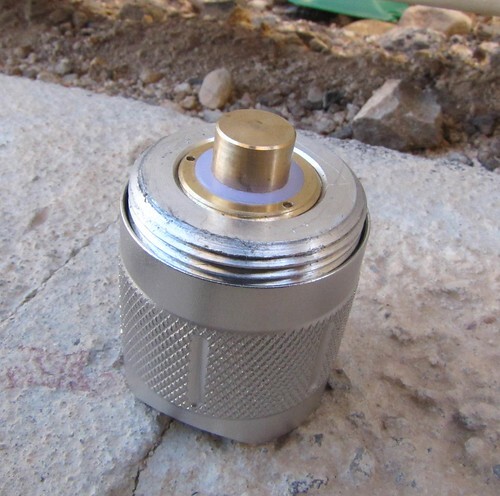 Perhaps a little overkill with this tail cap switch design but I like it nonetheless . . . .
. . . . a copper (or brass?) 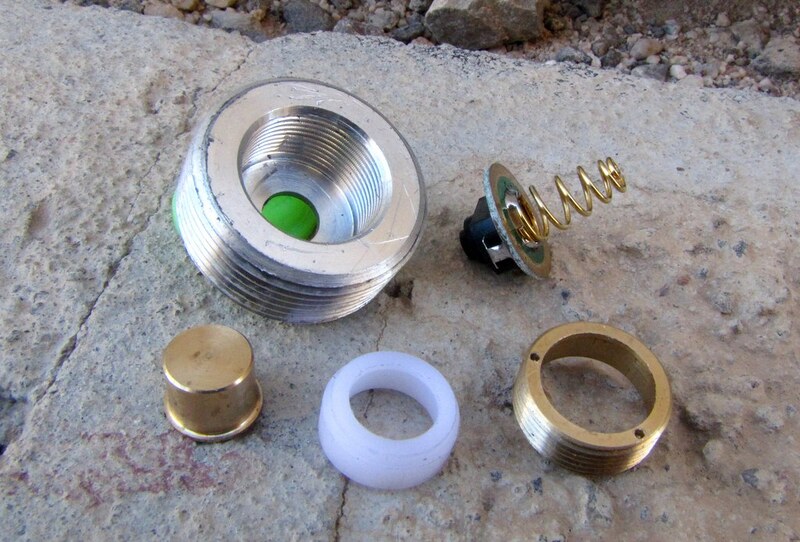 collar with spring cap and nylon bushing screws into a larger donut which, itself screws into the tail cap . . . . It has been suggested that perhaps a longer battery might work better with the spring cap removed . . . .
. . . . King Kong 26650 on the left and a Panasonic 18650 on the right, inside the provided battery sleeve. 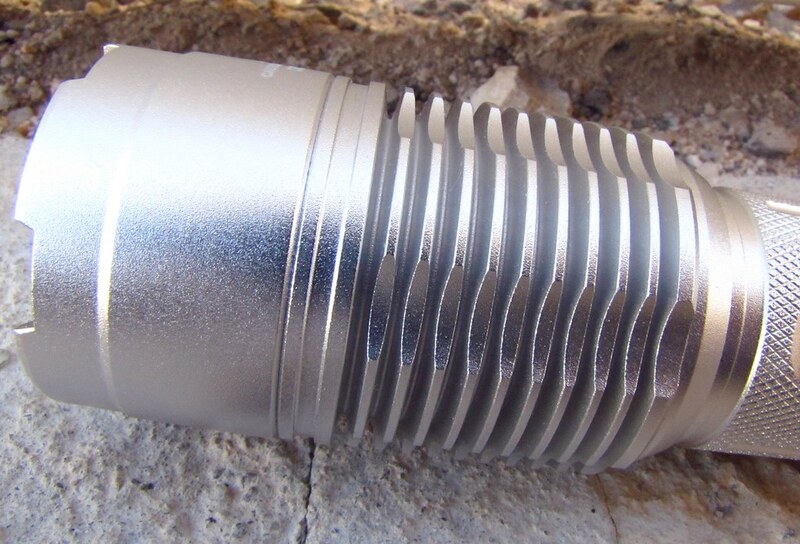 The sleeve fits loose in the tube but with the tail cap tight, there is no rattle. 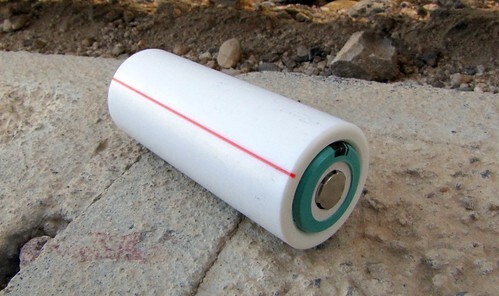 Also note; batteries with thicker wrap are a snug fit inside the sleeve. 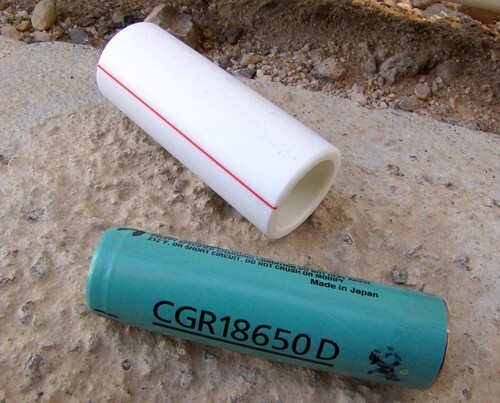 I had one layer of tape wrapped around this battery and it would not fit. The sleeve makes the JM07 Pro that much more versatile. Threads are nicely cut and feel smooth enough, I suppose. Also; Foy likes red o-rings. 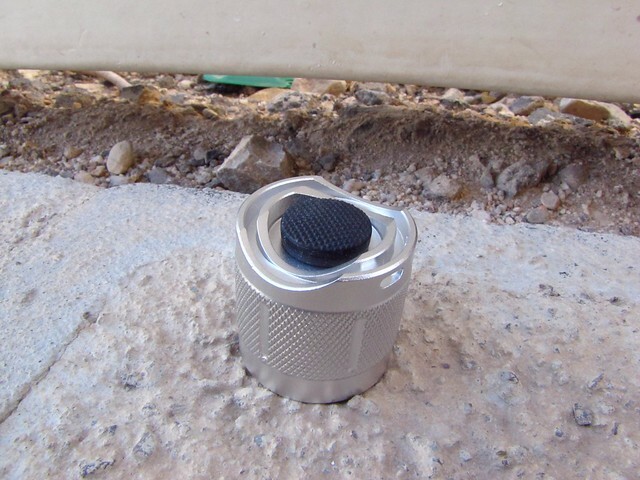 Screw-in copper pill surrounded by thick aluminum, inside 10 deeply cut cooling fins suggests the JM07 Pro can handle a lot of heat. The view under the reflector is very tidy. The included accessories with the JM07 Pro is pretty awesome. 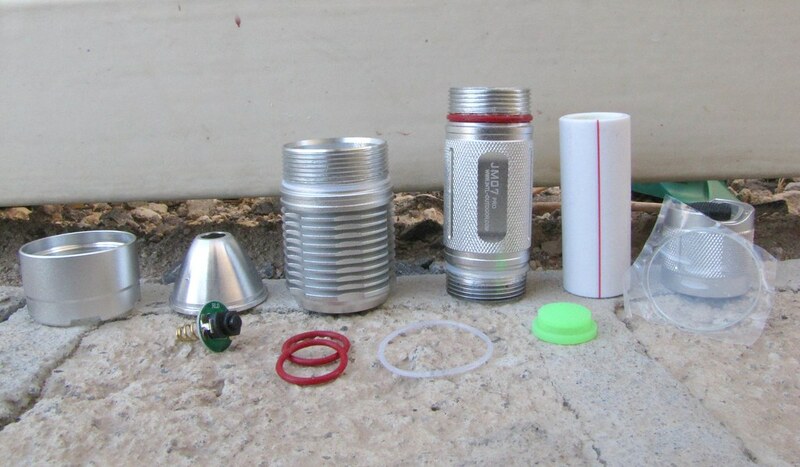 You get a complete extra switch, o-rings, an extra boot, battery sleeve and a lens shrink-wrapped in plastic. Not pictured is the King Kong 26650 battery that comes with this kit. All beam shots were all taken with a 1/4 second shutter speed @ f2.8. This is my grey L2P with a 3-mode Manafont/UltraFire XM-L drop-in. 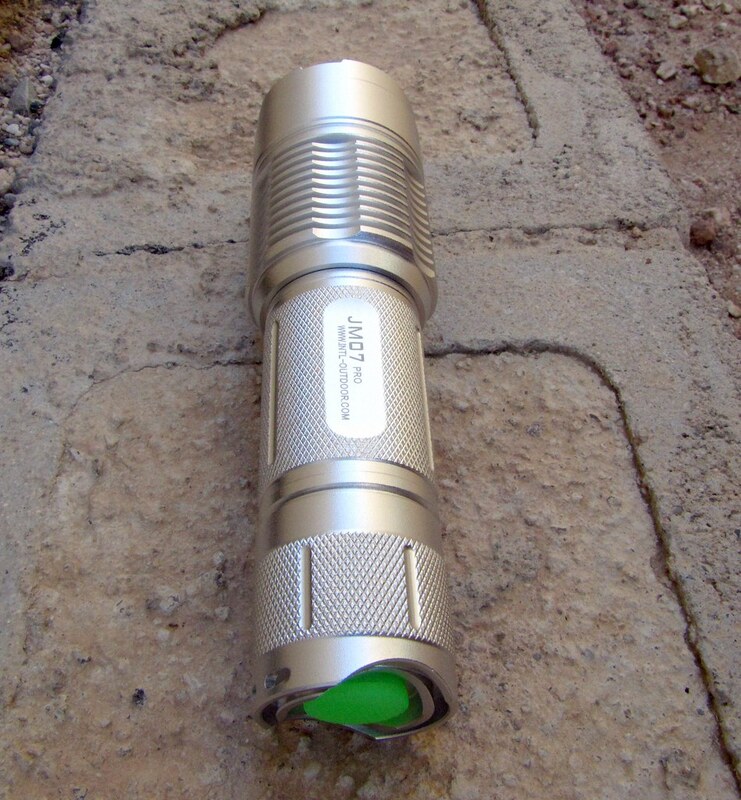 Shadow JM07 Pro with a King Kong 26650. 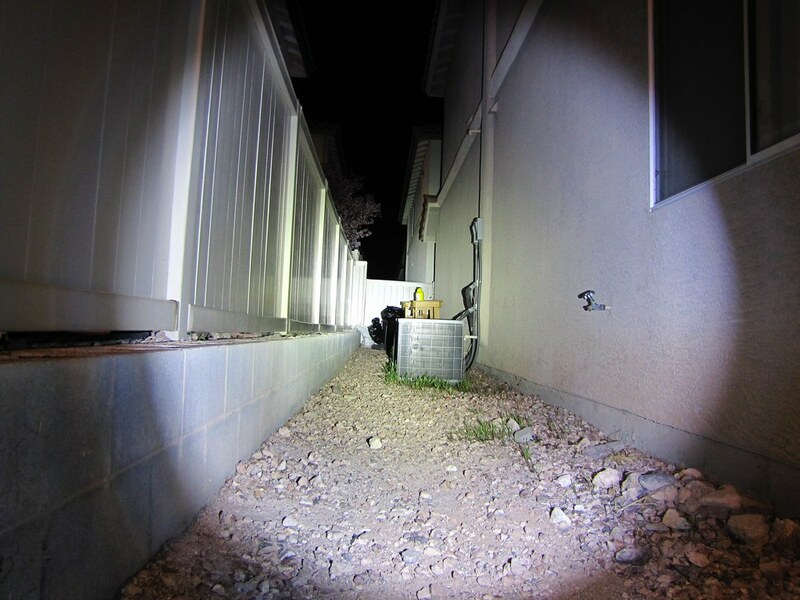 Shadow JM07 Pro with a Panasonic 18650. The JM07 is well regulated and pulls exactly the same amps with both batteries. I installed the included black boot because Foy has moved past the ostentation of GITD. 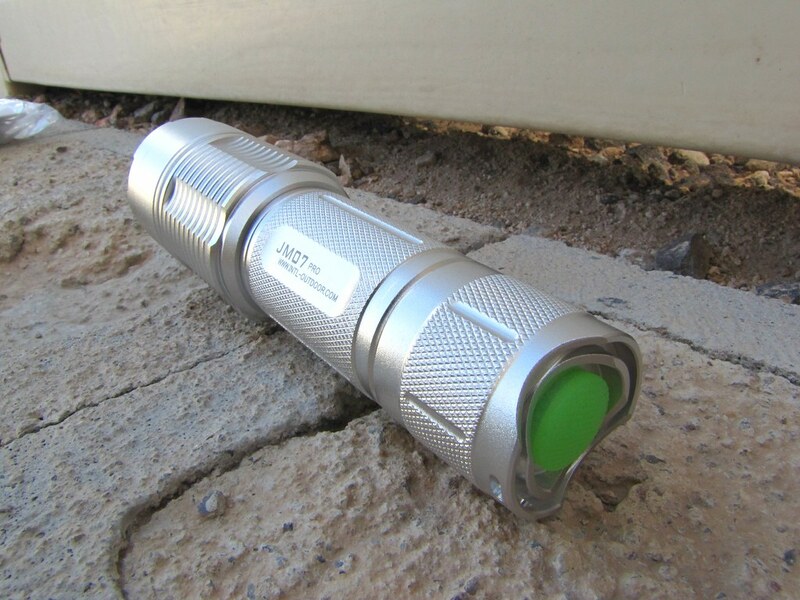 This is a very nice flashlight, guys. If I had it to do over again I would get the gun metal if I could, or black. 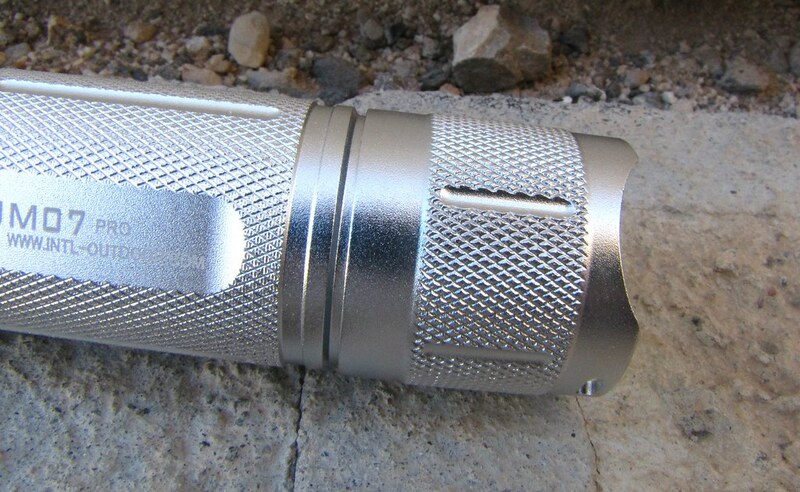 I think silver is less than ideal for such a masculine torch but overall, this is a top quality product that is more than just a little bright and it actually has some throw too. I guarantee you will like your Shadow JM07 Pro. Good picture shots & nice reviews! 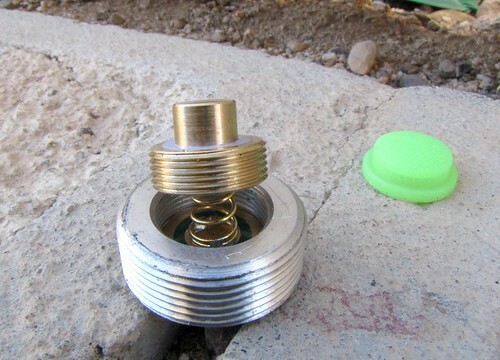 Its good to see that there are two holes drilled in the tailcap so if you use a lanyard it will not interfere with tailstanding. Have you had a chance to compare it for throw with your renowned 980L. JM05 still to come? Great review! Thank you very much Foy! I for one love that they have given the surface this rough texture because it makes the silver stand out so much more du to the shimmering effect. Thanks for the great review! I need to borrow your time machine so that I can go to the future and get my flashlights without all the wait. I really like this one. The .com on the side bugs me though. Actually I hate it. The brand and designation would have been fine. Nice review Foy. Bumped. Not buried. Thanks, Foy. Very nice review. Thanks for posting. That's what is on a neck lanyard in my shirt pocket. I love the light. Took 21 days to receive. They charged me $62.00 and told me no discount. 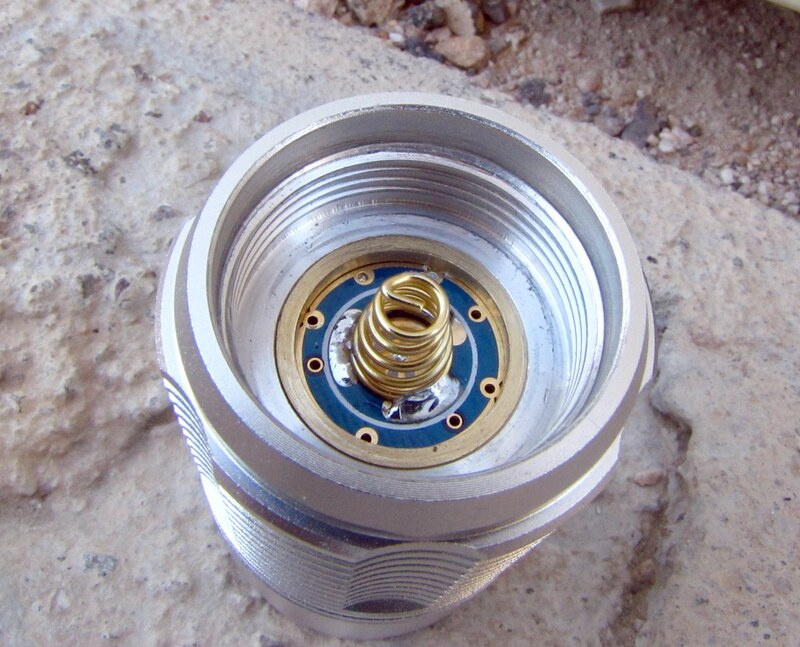 How to get the emitter out? 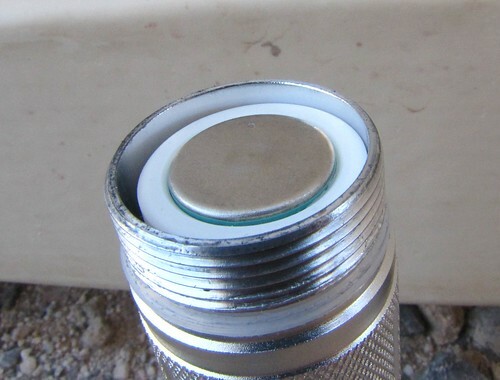 Do I need to add additional alum./copper for heat sinking. I geased the "O" rings and threads. Any advise on anything to do? Great write-up covered everything and 100% correct my observations too. Thx for the informative and great review Foy! Looking forward to getting mine. 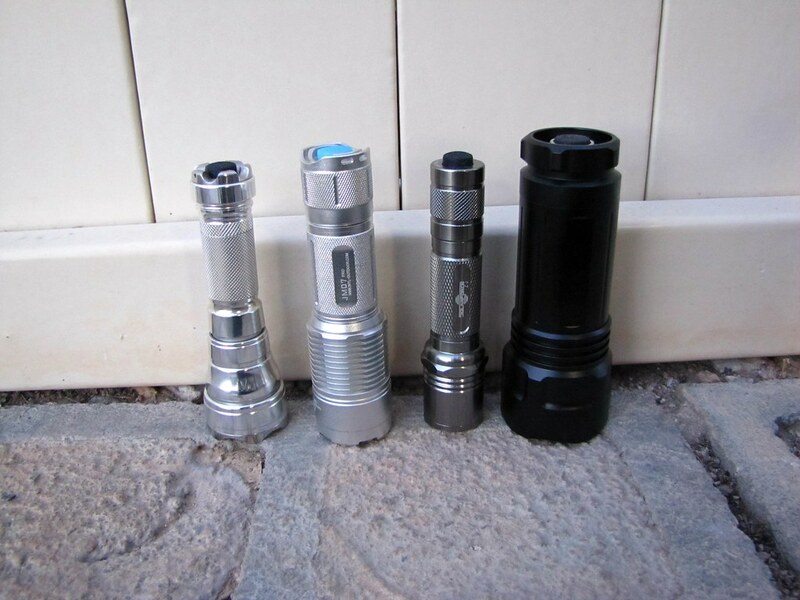 This is my flashlight collection. I think it is a screw-in pill so, the wife's pointed tweezers should work. 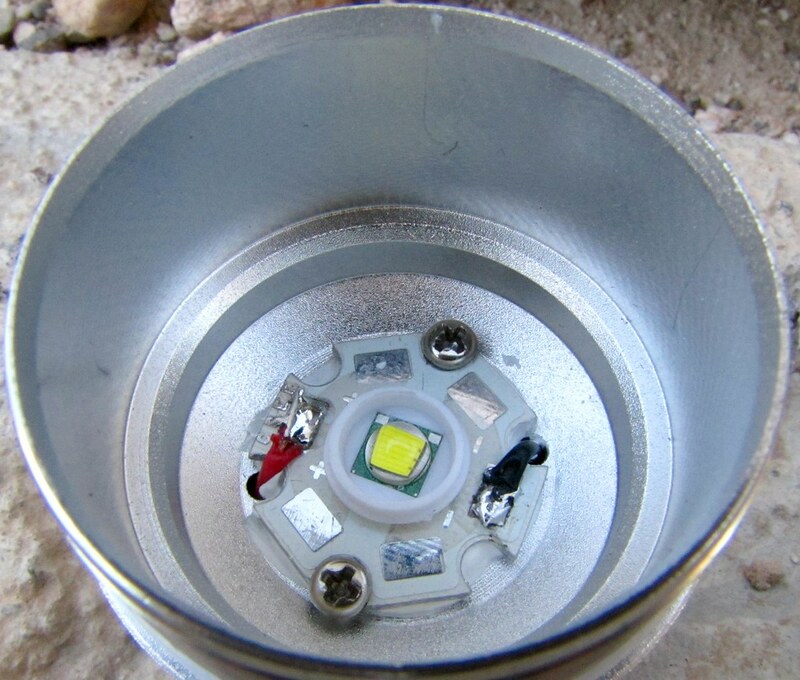 As for heat, this light doesn't generate a lot. It gets pretty warm after a while but this may be one instance where the fins do more than just look good. The only difference is my aim. Wow, incredible details and shots Foy. Very well done, thanks a lot! 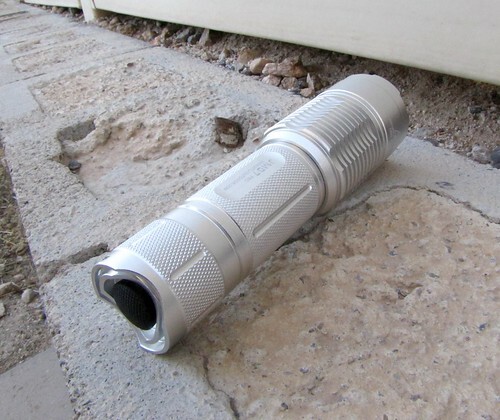 I so like this flashlight. I feel strange because of that.... 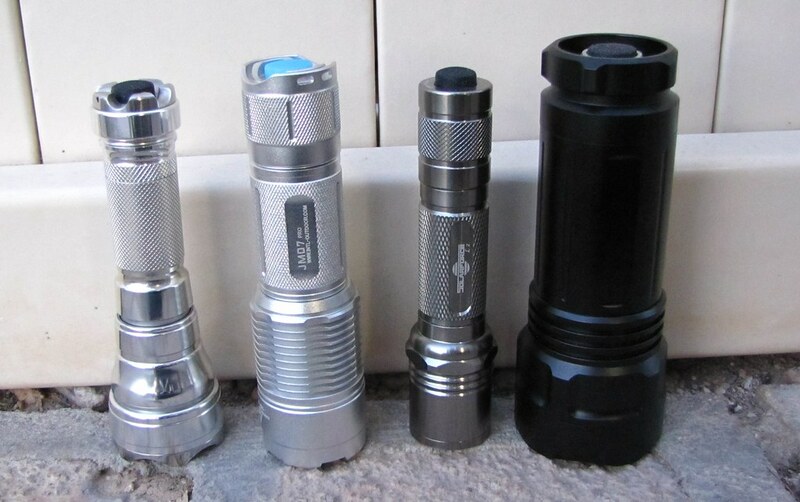 I actually don't like silver and other-than-black flashlights. Mouse out is a CLEAR winner. I'm going to be so sorry after it's sold-out. Damn, I *really* like it. Who here is a representative of intl-outdoor? I have some questions for him. 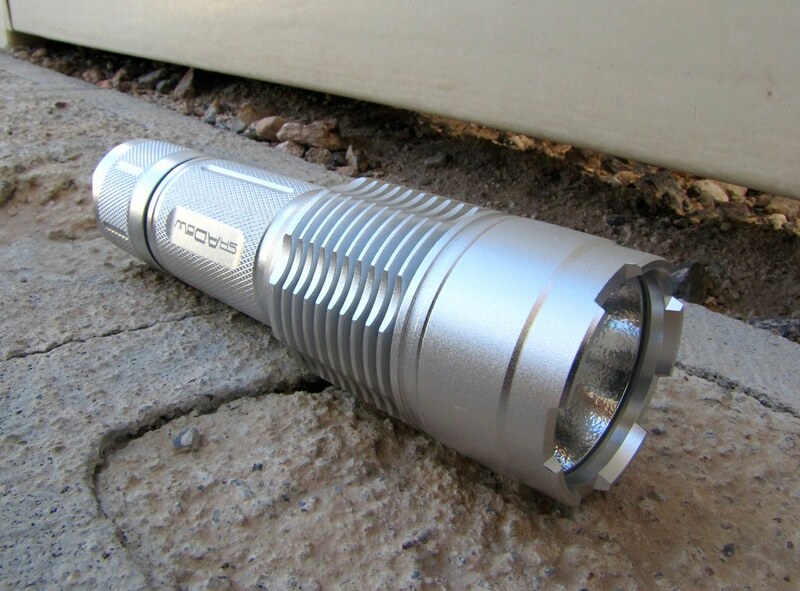 Foy, can you please post some more pics of this flashlight near other flashlight of similar size? Perhaps near a DRY and UF-980L and whatever else you deem comparable. I'd like to see some comparison of this "white" color. If you have some clear silver polished to put in the group shot, that'd be great too. No problem, Viktor. It's the least I can do for you helping me with the mouse over. These are the best I can do in the 7:00 pm available Las Vegas light . . . I included my naked 980L because it is about as natural, polished aluminum as you can get. An older silver L2 on the other side and my Dry for size comparison. Not sure if the JM07 would polish up this good . . . and I don't think I want it to be that shiny, anyway. Actually, Foy is burned out on silver. I came real close to accepting a trade offer from another member for his gun metal JM07. My instincts tell me to hang on to it however, and I fell in love again after the blue boot booty change. Thanks, Foy! Great shots as usual! 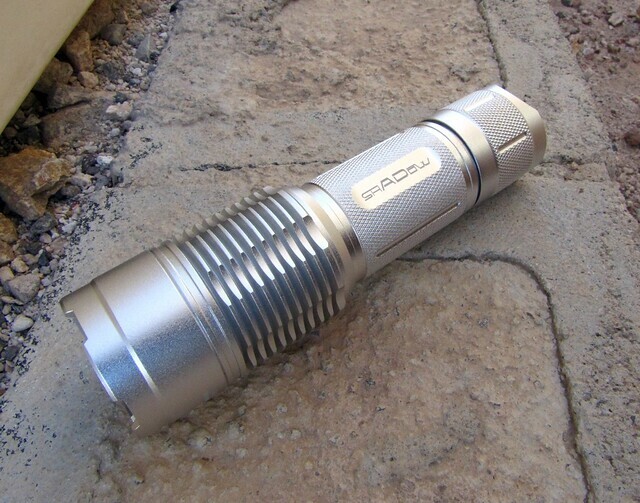 I hope I'm not pushing it too far, but... do you have any other gun metal flashlights to compare? If you don't feel like going out again, any room shot would do, or even tomorrow... No hurry. I probably need to sleep on it anyway. I'm thinking about creating a video how-to post a mouseover. 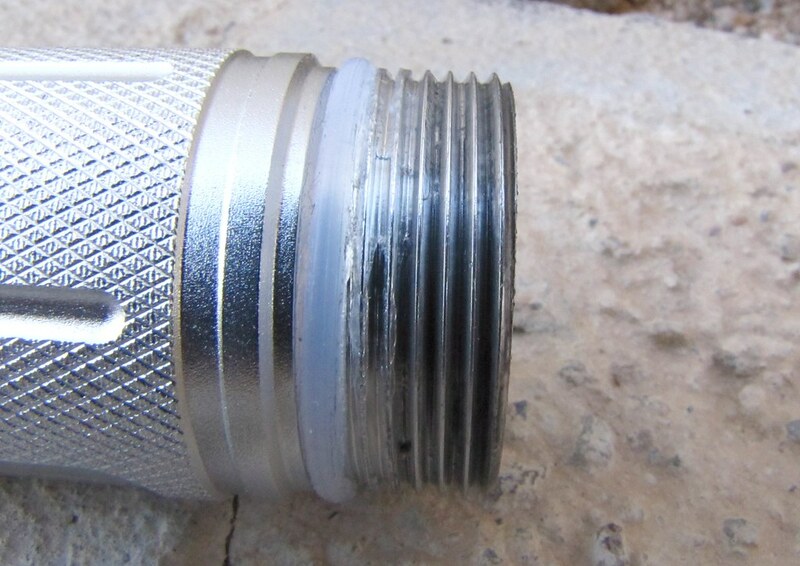 The L2 is ano silver. I've got a gun metal L2P and the V9 . . . I'll put them up later tonight - it's not a problem. Whatever I can do to assist vacuuming peoples' wallets. I know if I just sit down and slowly do it, I can master the mouseover. I just got some inside info from Hank. It seems that some time after their order of "whites" was produced, their manufacturer decided to offer the white version on the Chinese market. It would seem we can expect more silver/white copies soon. Hank mentioned that the manufacturer did not respect their agreement. If he's mistaken, this might be false news, but I believe his intel. I believe it too . . . and, I expected as much. About as "limited" as a Buick Limited. Ahhh well, gotta respect the market. 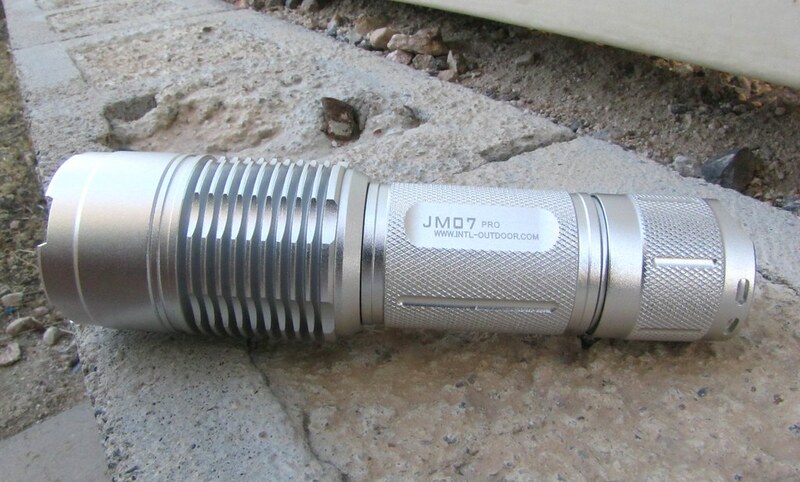 As for JM07 Pros with the dust silver finish ("stone white"), but obviously without Hank's web address, I have already seen these advertised on one other site.